You know you need a better prayer life. It's time to work on the foundations. Maybe you are brand new to prayer. Maybe you've prayed for decades but need a fresh start. Is it possible to develop a regular practice that feels like life rather than discipline? Is it possible to make prayer more than a routine recital of the same old things? Are there ways to dig deeper so you can be more truly honest with God? Yes. Yes. And Yes. Martin Luther and John Calvin will show you how. My online class Pray Like a Reformer will start where you are and build solid foundations. The greatest Protestant Reformers taught their followers the bedrock biblical approaches to prayer. In this class we'll explore their teachings. You will develop a manageable daily prayer practice. With Luther you will push yourself to pray about all the things Jesus taught us to pray about in the Lord's Prayer. With Calvin you will allow the Psalms, the Bible's own prayer book, to help you reach deeper into your own life. Altogether prayer will be more regular, richer, and more honest. Make this Fall a time of renewal in your relationship with God. We will learn about and "try on" approaches from two great branches of the Protestant Christian faith: Lutheran and Reformed. We will keep it practical and manageable -- we'll each spend 15-20 minutes per day actually praying in the ways taught by great teachers of the past. 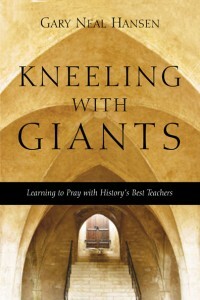 We will use two chapters from my award-winning book Kneeling with Giants: Learning to Pray with History's Best Teachers (InterVarsity, 2012). We will have weekly video lectures to introduce the week's approach to prayer. We will build community in a private discussion forum -- that way we support each other in the journey and learn from each other's experiences. That little bit of daily prayer practice is crucial. You can't learn to ride a bike by just reading a book; you have to push off and pedal. You can't learn how to succeed in marriage just by reading a book; you have to enter into relationship. And you can't grow in prayer by just gathering information. You learn to pray by praying, trying on new approaches, and reflecting on the experience. Q. Life is intense. I don't have time for this right now. A. That makes perfect sense. Though registration will only be possible for a week, you don't have to access the course until you are ready. My aim is for it to remain available to you as long as I have the website. Q. I'm not Lutheran or Reformed. Is there anything here for me? Absolutely. The point is to learn from wise followers of Christ, whatever their background. 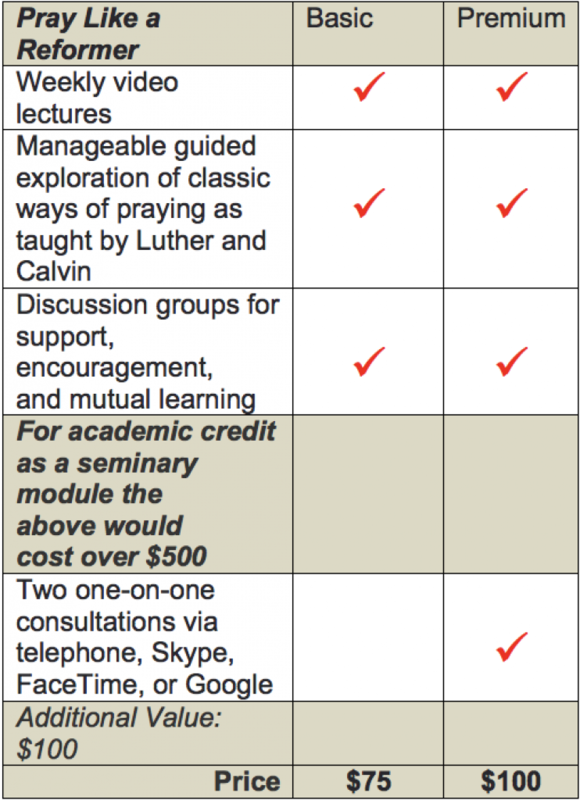 Luther and Calvin have a lot to offer every Christian. When I wrote Kneeling with Giants I drew on the full spectrum of Christian teachers: Catholic, Orthodox, and various Protestants. I've had really positive feedback from clergy and laity in all these traditions. Q. I think that personal consultation with you would help me more than a class. Is that an option? Yes, the "premium level" of this class includes two one-on-one consultations with me, one in the first half of the class and one in the second. If that sounds helpful, I hope you'll sign up! Q. I'm an introvert. I don't want to post in the forums. A. I understand -- I was online a long while before I started posting. You are not required to post in the forums. They are there to help you. I suspect some will want to build friends there, learn from each other, and support each other. However you are totally free to just watch the videos and explore the prayer practices on your own. Q. I already have a quiet time. How will this fit in? A. If your devotional time is at least 15 minutes long, you can do the class "prayer homework" then -- so long as you are willing to try on new practices in that time. Of course if you don't already have a daily prayer time, you'll need to add one, at least for the next six weeks. But that is what the class is for, right? Q. Why is prayer something that needs to be taught? CAN it even be taught? A. There is a sense that prayer ought to be natural -- we were created for relationship with God, after all. But our nature is damaged by sin, and so not everything "natural" is "easy." The disciples asked Jesus to teach them to pray (Luke 11:1) and Paul said we don't know how to pray as we should (Romans 8:26). And in the time since the Bible was written, followers of Christ have discovered a rich variety of ways to go deeper with God in prayer. That's stuff that can be taught -- and it needs to be taught, because countless people really struggle with prayer. They may be new to faith. They may have been taught that there is only one "right" way to pray, but found it didn't fit them. Q. Why do you charge money for the class? A. I do some things as a volunteer, and hope others do too. But things like teaching and writing are my paid work. Creating the class costs me time, and having my website costs me money. When I teach in churches, or lead retreats, or speak at conferences, I get paid for taking time to help people by sharing my knowledge. It is the kind of thing Paul was talking about in 1 Cor. 9:9-14 and 1 Tim. 5:17-18. Q. Is this just the history of prayer? A. No. We will look at people from the past and listen to what they said about how to pray. But more importantly we will spend time praying as they taught. Q. Will there be homework? A. Yes, but it won't be graded! Each week you watch the video, read a bit of Kneeling with Giants, and pray as instructed for about 15-20 minutes per day. There are also discussion forums for those who want to chat with others about your experience and reflections. Q. Will there be space for discussion and reflection with other participants? A. Yes, I'm setting up discussion forums. Not everyone will want that, but I think those who join a discussion group will get the most out of the class. If participation is large we can divide into smaller discussion groups. Q. How much time will I need to put into this? A. If you do it per instructions, each week will be about 20 minutes of video, part of a chapter of my book, and 15-20 minutes per day of praying. Hopefully you already pray that much, but if not it will add a daily prayer time to your schedule. A. Having the book will help a lot. People will be able to follow the instructions from lectures and stuff within the course, but reading the book will add another kind of input and will frankly be able to give more depth than I can in the lectures. Q. Do I need to be tech savvy, or to have taken previous online courses? A. No, you don't need to be techy, and you don't need any special programs. The class is on my website, so it will appear within whatever browser you use to visit websites. I use Safari and Chrome browsers with my site and both work well. I can't vouch for others but I don't anticipate problems. Q. How will I find my way around the class? A. Navigating the class is basically a matter of looking for the on-screen instructions. The right sidebar will have a link to each week of the class (similar links will be at the bottom of each week's page). Once you are in a particular week, everything is there on the page -- the video lecture, instructions for reading and praying, and a link to get to the discussion forums. Q. Do I have to watch the lectures at a particular time or schedule time with other group members to make the discussions work? Q. Can I take the course with a friend or a small group? A. The course is sold for individual use only. So if you want to go through it with others, you and your friend, or all the members of your group, need to purchase it individually. Q. Is your site secure for taking my online payment? A. Yes. If you look at the URL for the page you'll see that I have HTTPS encryption. A. Yes! You will see the PayPal option on the checkout page. Q. Will I get a receipt? A. Yes. It will come by email immediately after you register. Some have found this receipt got stuck in their junk mail folder or spam filter, so you may need to look for it. Q. Will signing up for this class put me on your mailing list? A. You will get added to an email list for online class alumni, but not my weekly newsletter. This is so I can communicate by email with the class, and also will allow me to let you know about future classes when they launch. Every email will have an easy unsubscribe link. And of course I will not share your information or spam you. "No dry academic, Gary is an engaging speaker who held his audience right to the end. With his rare combination of an historian’s mind and a pastor’s heart, … His winsome style, poignant illustrations ... undergirded a very practical presentation for all those wanting to love God with all their heart, soul, mind and strength." 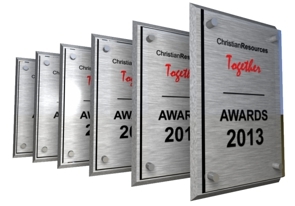 "Devotional Book of the Year," from UK booksellers' association Christian Resources Together. "Best Book of the Year on Spirituality," from Hearts and Minds Books. "We invited Gary to lead us in how to pray and be leaders of prayer, but what we got was so much more! … what he said and what he did was so compelling and transforming." If you regret signing up in the first 30 days, I'll refund your money with a smile. Of course. I want you to be happy. How to develop a life-giving rhythm of prayer in the midst of ordinary life. How to pray with confidence that what you bring up is exactly what God wants to hear about. How to stretch beyond the boundaries of what we habitually pray about. How to bring Scripture into your prayer life even if you are not an academic type. How to be more honest in prayer, letting more of your true self into the conversation. And, of course, you'll discover how fun it is to explore prayer with the good company of other open-minded lovers of Christ -- people like you, who want to learn from history and cross the lines of denominations! Registration is now closed, but click here to get on the waiting list for upcoming prayer classes: Put me on the waiting list!